Major money managers on Wall Street say tax reform is the most pressing economic issue for the next US president and Congress to tackle. Barron’s Magazine published its biannual Big Money Poll of money managers last weekend, which included this finding. According to the poll, 39% of managers are urging tax reform, 17% want reform of entitlement programs, 15% said infrastructure spending is top concern, and 10% picked defeating ISIS and stabilizing the Middle East. If the election were up to them alone, the race would be deadlocked, with 31% of managers picking each candidate in the poll. But most of them think the rest of America will elect Hillary Clinton over Donald Trump, in a 60-40 poll result. 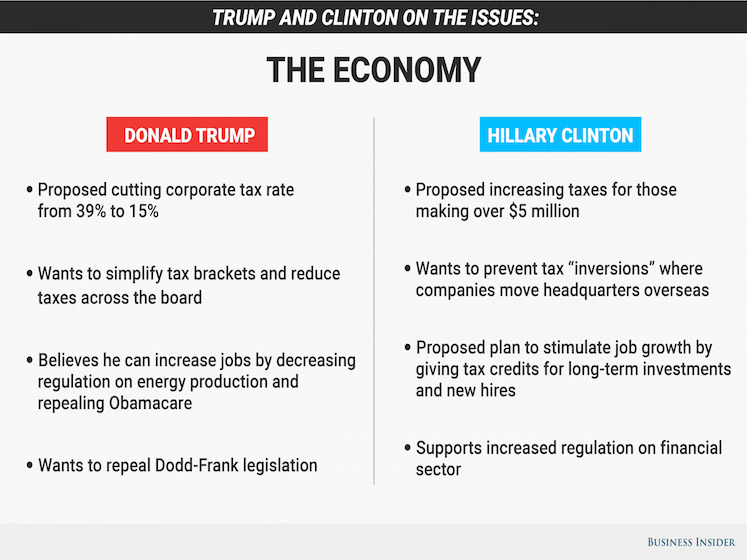 With Wall Street contemplating a Clinton victory, it’s no surprise that money managers think tax reform is the most pressing economic issue. As Business Insider’s Bob Bryan recently outlined, Clinton plans to prevent corporate inversions in which companies move their headquarters overseas to pay lower taxes. She has also proposed a “Fair Share Surcharge” that would increase taxes for people who earn over $5 million a year by 4%. Meanwhile, Trump has said he will cut the unusually high US corporate tax rate from 39% to 15%. “Donald Trump’s tax plan sounds good,” said Bob Landry, a portfolio manager at USAA Investments, where he helps manage over $20 billion in asset-management accounts. “If we were to cut corporate and marginal tax rates in this country, we’d get more capital coming back to the United States,” he told Business Insider in an interview before Barron’s poll results were published. The Barron’s poll also found that 45% of respondents were bullish or very bullish about the market through mid-2017; many who were neutral in the spring turned more positive in the latest poll.